SysAid > Company > Newsletter > Issue 40: New SysAid iPhone App: Get it this June! Welcome to the next generation of IT management! With the official release of SysAid 7.0 now available, you can upgrade to the biggest and best SysAid release to date. If you haven't already upgraded, now's the time to visit our upgrade page and download the new release, read the release notes, and watch the SysAid 7.0 Flash Presentation. With over 130 new features, there's truly something for every IT pro in SysAid 7.0! One of the most exciting developments you'll soon find in SysAid 7.0 is our new iPhone application. SysAid Helpdesk App is specially designed to give you the tools you need to manage your helpdesk even when you're on the road! Apple is in the process of posting SysAid Helpdesk App in the App store, so you won't have to wait much longer until you can get started with it yourself. We'll let you know as soon as it's available! This June also gives you the chance to get started with the new SLA/SLM module. Built according to ITIL best practices, SysAid SLA/SLM gives you the tools you need to provide better support and improve your IT performance. As part of the new release, we're happy to offer a special promotion of our newest module. Until June 24, 2010, you can get 30% off SysAid SLA/SLM! Get more information about the promotion and catch the deal before it ends! To learn all about what SysAid SLA/SLM can do for you, join us on June 8 for the SLA/SLM webinar. It's free, it's live, and it will show you how SysAid SLA/SLM can help you improve your IT performance and meet your goals. We look forward to seeing you there! Enjoy SysAid 7.0 and have a productive and fulfilling month! Poll: Do You Mind Providing Support to Your Family and Friends? Take SysAid 7.0 with You on the Road! We all know that the work of an IT pro doesn't stop just because you're out of the office, and so many of us now rely on our Apple gadgets to get the job done even when we're away. As we developed SysAid 7.0, we knew it was time to give you the tools you need to manage your helpdesk anywhere, anytime. This exciting new innovation will soon be launched: the SysAid iPhone application! To be available in the iPhone App store this month, SysAid Helpdesk App is totally free for all SysAiders that need to manage their IT helpdesk on the go. You'll now be able to use your favorite Apple gadget to deliver superior technical support from anywhere in the world! Because we're just as much into our iPhones as you are, we took what you need most from SysAid's helpdesk and built an application that's specially designed for your iPhone, iPad, or iPod touch. Use your normal SysAid account log-in info and take SysAid with you on the road! What can you do with SysAid Helpdesk App? Get the flexibility you need to deliver superior helpdesk support anywhere, anytime - for free! 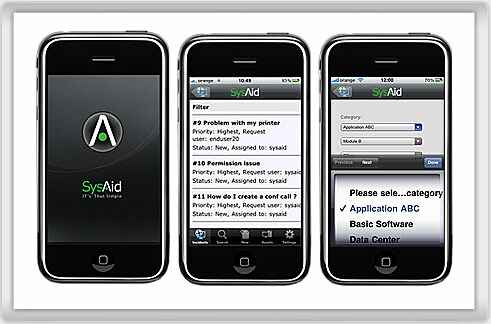 We'll let you know as soon as Apple makes SysAid Helpdesk App available in the iPhone App store. Give us a rating, leave your reviews, and take SysAid with you everywhere! 30 Days, 30% Off Our Newest Module! With the release of SysAid 7.0, we're happy to offer a special, limited-time promotion: for 30 days, you can get 30% off the new SLA/SLM module! This is your chance to save on an important new tool that will not only help you provide better support, but is also essential to improving your IT performance. Provide Excellent Support and Improve Your IT Performance! Today's technology users are more demanding than ever, and your IT team is responsible for much of your company's well-being. The new SLA/SLM module gives you the automatic reporting tools you need to get an immediate snapshot of how you're managing to meet your company's needs. With the SLA/SLM module, you can guarantee that you provide the best possible service and improve end-user satisfaction. Create Service Level Agreements (SLAs) on the quality and speed that your IT team is expected to provide and make sure that you meet these SLAs with predefined routing rules, priorities, due dates, escalation rules, and operating times. The SLA/SLM module comes with preconfigured measurements so you can immediately get started! Having an easy and efficient way to evaluate your IT processes is crucial even for the smallest of companies. The SLA/SLM module is completely integrated with SysAid's helpdesk, so it automatically calculates important measurements and grades your IT performance. You can get an instant snapshot of your performance in real-time in the colorful Service Management Dashboard. Notice that the percentage of reassigned incidents has been going up? 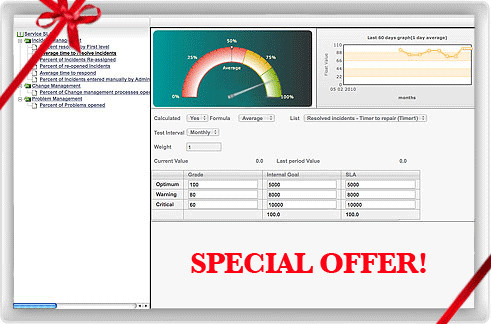 Drill down on the measurement and take a look at the components with which the measurement is calculated, right down to individual service requests. Locate the problem, take the necessary actions to fix it, and improve your future performance. Because your IT department has its own unique set of processes, you can easily create your own SLAs and measurements to suit your specific demands. Determine the optimum, warning, and critical values for your dashboard, track the number of service requests in a specific category, and analyze performance per admin. It's up to you to decide! The special SLA/SLM promotion is available until June 24, so act now and get 30% off this important new module! Request a cost proposal now! Join Us Online on June 8, 2010! See how this new module can work for you - register now for the webinar to reserve your spot! Exciting news for Aussies - SysAid has officially opened a new branch in Sydney, Australia! With an ever-growing international customer base, our goal has always been to provide the best possible service to SysAiders in every time-zone. With the new SysAid Australia branch, SysAiders in this region can now receive SysAid support locally! Leading the SysAid Australia team is General Manager Pierré Uys, long-time SysAid Partner and IT pro extraordinaire. With many years of experience as an IT manager and CIO, Pierré is also a true SysAid expert. "My goal with SysAid Australia is to provide excellent customer service for SysAiders throughout the continent. My philosophy is that IT departments deserve the opportunity to simplify their processes and have all their checks-and-balances in place with audit ability and real-time reporting. I hope to rapidly develop the Australian SysAid Community to help SysAiders provide their supported organization with first-class service." We wish a warm welcome to all members of the SysAid Australia team. To get in touch with them, you can now write to support@sysaid.com.au! New Release, Better EULA for You! To read the End-User License Agreement (as well as check out other important SysAid FAQs, guides, and how-to material), check out the SysAid documentation page! SysAid 7.0 is a new release that provides you with more precise information and helps you channel your energy to where it is really needed. One of my favorite new features that truly gives you more control over your IT environment is "Online Users." 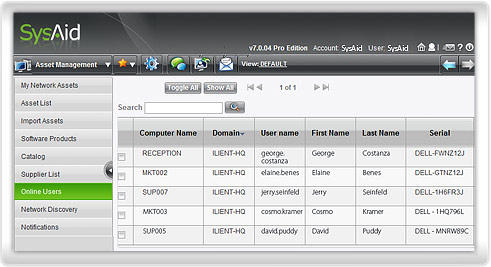 Under Asset Management, "Online Users" is a completely new view where you can now see a list of exactly which end-users are online and logged-in to the network. Even more, you can see exactly which computer they're using. This functionality is based on deployment of the SysAid Agent. You can also know when an end-user is available to chat or if it's a good time to perform a remote control session. Knowing which end-users are online at any given moment can help you communicate more effectively with them as well as use your time more efficiently. I'm sure you can think of many other instances where this feature will help you, so feel free to share your ideas on the Community! Do You Mind Providing Support to Your Family and Friends? Do you mind providing technical support to your family and friends in your spare time? It's OK, you can be honest - we all can relate!